What do you have to do – and when? If you want health insurance beginning Jan 1, 2018 – you must apply and enroll between Nov 1 and Dec 15th 2017 – get help before then! Want instant savings on your monthly healthcare insurance premium? Healthcare.gov estimated that about 8 in 10 of the uninsured who are eligible for Marketplace coverage qualify for financial assistance to lower the cost of their monthly premiums. These savings make healthcare affordable for people whose tax household MAGI (modified adjusted gross income) is between 100% and 400% of the Federal Poverty Level. 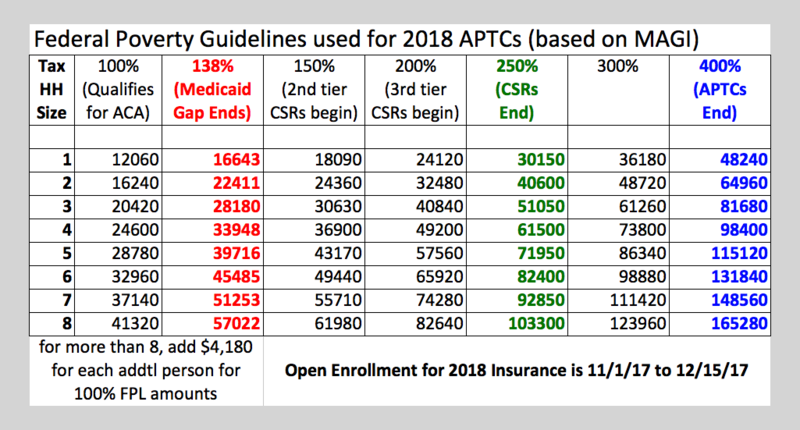 Talk to your local ACA Healthcare Navigator so that you fully understand what your “tax household” and “MAGI” is – then use the chart below to see if you might qualify for instant savings! And remember: Premium Tax Credits (PTC) and Advance Premium Tax Credits (APTC) – along with possible additional savings with Cost Sharing Reductions (CSR) are only available if you purchase Affordable Care Act Insurance through the Marketplace. Get Covered. Avoid Penalties. Ask Questions. Know your Rights. Are you eligible for one of the Federal Marketplace health insurance plans and do you qualify for financial help? How can you avoid paying a penalty? Do you understand your options and are you being treated fairly? Find out what you absolutely need to know about the Affordable Care Act (ACA) and get a quick estimate to see what the possibilities are for you.